I really like this design, and your approach and attitude here - good luck! Any consideration given to some tie out points along the seams mid way up each edge of the triangles that make up the panels on the non door sides? Seems like those would be the most prone to wind loading. And might be useful low weight additions. Also, one of the benefits of this design over others is the 2-wall. Based on your responses in the discussions, it seems that using an inner only setup could be made slightly easier. Would be a shame to reduce the utility of one of the selling points of the design, by not making an inner only setup somewhat easy. Thanks Nepherim for the kind words and the feedback. I have considered guyouts half way up the tent in the seams. Actually several of the early generation prototypes had them. I ditched them partly because if mis-used it can really result in a warped pitch, but also because I don't think there is substantial need for them in the use case that the X-Mid is designed for. What I mean is that with the peak guyouts deployed, the X-Mid is already quite solid - plenty solid for strong winds that might occasionally be encountered on a backpacking trip. What I'd like to do someday is create an "Alpine" version of the X-Mid that is beefed up a variety of ways: tougher materials, more guyouts, a few other features, maybe a solid inner. This version would have these, but isn't coming anytime soon. It would probably end up around 34oz and would likely be quite a bit less popular. Regarding the inner only pitch, I feel that this is a selling feature moreso than a common use case, although I know some folks really use it a lot. I know with my StratoSpire I was glad to have that option, but only ended up pitching it that way once in hundreds of nights. So with the X-Mid I wanted this to be possible, but I didn't want to add much weight/cost catering to that. There's so many little features that are nice to have, but collectively the weight adds up. If someone does want to frequently pitch it inner only, they could easily add guylines to the inner that stay in place - even with loops or rings for the pole tips if desired - so a little prep once and it would pitch super easily inner only from then on. But I expect >90% of folks will almost never pitch like this. And if they wanted to, I think transferring the guylines and tying two clove hitches is a reasonable process. I appreciate everything is a trade-off. I do think this tends to expose a more USA-centric build though. Much of Europe for instance frequently gets conditions where more reinforcement may be needed on a typical hike (Scotland, north Europe, etc) -- now whether it's needed for this design clearly way to early to determine that. In terms of the inner -- not sure I agree there either, but again, you note an inner only pitch is do-able, so no real issue. But, valid points, and you do need to draw the line somewhere. Hope this all goes well for you! Thanks for the feedback. Appreciated. Guyouts half way up the seams do make a tent more solid in severe conditions. Having these half way up the seams is much better than having guyouts in the middle of the panels, as panel guyouts can really warp the tent shape (e.g. pull a 4 sided pyramid into a cone shape). I think the X-Mid is robust enough to handle serious conditions with just the peak guylines, but certainly users frequently extreme environments could benefit from them. Personally I usually find mid-seam guyouts the most valuable to aid with snow shedding on tents that have low angle walls ( e.g. snow collects easily on single pole mids without these). If I ever do an "alpine" or "4 season" version it'll have them. Dan, do you have a 2 person version? No. I'd love to do one eventually but it'll be a while off. I’m 6’2”- will I fit into this footprint? Yes. The tent has a fairly generous length so someone who is 6'2" will fit reasonably well into the tent. My brother is 6'2" and 280 lbs and he was comfortable in the tent inside a sleeping bag. Is there a pocket at the top of the inner tent? No it's a Zpacks Duplex. You're killing me. I want to make that so badly. I think the X-Mid layout is well suited to a single wall because the walls are consistently decently steep, so even in high condensation conditions where substantial condensation in unavoidable, water droplets would likely run down the fabric rather than drip on the inner. Most tents have at least two panels that are somewhat low angle, such as the roof panels of a Duplex. I was looking at the materials spreadsheet today and a 16oz cuben single wall wouldn't be hard. That could even have two doors. Yeah...I haven't been able to justify paying for cuben because I don't like the complexity of the available designs, but I would get one of these. I know another similar tent like this, but weighs twice this tent. I think you've made a good job, good design and competing to the famous Zpacks Duplex. Thanks. What is this similar but heavier tent? i wish i read this before the drop expired ;( this looks fantastic! i had been looking at the SD high route for a while, but a few things really irked me about it's design, looks like you've solved all these problems. well done mate! i'll be looking for this outside MD in future, you got a website i can track? I've been meaning to start a website with more info and videos on tents, but it'll just direct customers to Massdrop because Massdrop is doing all the manufacturing at this point, so they are the only ones with tents to sell. I hope they'll have some in stock in the spring. I presume they are ordered more tents than were pre-sold, but I'm not sure. If you follow me on YouTube, I'll probably be posting a video every month or two with some new looks, info etc. great! thanks much for the reply, and look forward to the return of the x-mid! I wish - so busy....so many cool projects on the go including the first prototype of the 2P arriving this week. I'll get it done sometime this winter. Yup. It's pretty sweet. Most aspects of it are looking pretty dialed in. A few things to tweak. I'm thinking of making the floor a bit wider to 50" instead of 47". The weight of it is awesome. What weight are you aiming for for the 2P? No it's too early....I'm saving those for a few months. And the color of the first 2P prototype is ugly. My first buy ever. Bought this for my July trip to Iceland! Thanks for an awesome design. If you had not been so responsive in the comments and shown your knowledge, I wouldn't have bought. I can't wait to get it! Not sure what your level of experience is with Iclenad but just thought I'd mention that I'd be a bit careful using this in there as it can be extremely windy and wet. I did 7 days of trekking there in the last week of August / September and definitely would not have wanted to use a tent like this. My Hilleberg Akto did the job well. The Atko is quite a different tent since it's a 4-season model. Thus it is quite a bit heavier despite being much smaller. It has only 36" of headroom (vs 42") and 9 sq ft of vestibule space (vs 28) yet weighs nearly double (46oz vs 28oz). That's because there's a lot of weight put into the heavy pole set and fabrics to make it more capable in serious winter storms. There certainly is a trade off between weight and strength, where you can always get a stronger tent if you put more weight into it. So certainly that extra weight gets you increased strength, but it's important to find a balance where you have appropriate protection for the lowest weight. I don't think a heavy 4-season tent is necessary for summer treks in Iceland. I know lots of folks that hike in Iceland including a friend that lives there, and all of them are using tents that are likely less capable in the wind than the X-Mid. For a trekking pole tent, the X-Mid is actually quite good in the wind because it has many stake points, good wall slopes and the peak guylines can be used in a variety of directions to reinforce the tent as needed. Yea I was there technically in fall although it was very early fall. There were 2 storms that would have been quite miserable in a summer tent. I had a 20F sleeping bag and a 4 season tent which adds warmth and wind protection, and even with all of my clothes and jacket on 2 nights were really cold because there was so much wind blowing through the tent. It was also raining both of those nights so if my tent had failed I would have been in a dangerous situation. Not sure if a 4 season tent is really necessary but my experience with ultralight tents is that they are sometimes liabilities in climates like Iceland, and are more meant for places like the US where weather is more predictable. When I was in Iceland 2 separate people had to be rescued in the area that I was in. The temperature of being slightly above freezing is very dangerous because its easy to get wet but hard to get dry. The wind is quite a problem as well especially because its hard to predict the direction. Personally I wouldn't bring a tent like this as the weather is pretty unpredictable but I've met people with very different philosophies who did just fine. The reason I commented was that I was personally quite surprised by the climate and I felt my research didnt prepare me enough. If I could do it again I would have brought an even warmer bag. I wasn't sure how aware you were of Icelands climate but it seems like you atleast know what you are getting into. Fair enough - I also think a lot of UL tents are particularly bad in wet, windy conditions because they make risky compromises like having a fly that doesn't extend to the ground (so wind cuts right through) and being single wall tents with no vents (so condensation can be a big problem). So a lot of UL tents are cold, wet and windy for reasons that don't apply to the X-Mid. The X-Mid fly extends right to the ground to block wind and I think it's perhaps the best UL tent out there in wet conditions because it has fly first pitch, double wall design, large vents, vents can close, fly still protects inner with the doors open, plenty of vestibule space for wet gear and the fabric is polyester so it doesn't sag and droop in the wet. So I don't think it would let you down in wet conditions, but certainly it has limits in extreme windstorms. In 4-season conditions it would certainly be stronger with a heavier fabric and a solid inner would be nice for stopping any drafts that make it in. For the 2P version, we are planning to offer both solid and mesh inners. When do you think the 2 person tent will be available? What will the dimensions be? I just placed an order for the 1p and I'm super excited to try out. Love the design and the quick and easy setup/take down/weight. Great job! Thanks for the support! You’ll love it. The 2P is going to have a 50” wide floor and be a few inches longer (~92”) and taller. So it’ll be a comfortably sized 2P, not a cramped one. The prototyping is going really well so we may be ready for a pre-sale in 2-3 months. However production does take a while so delivery would be fall 2019 I expect. Thanks for the response and that sounds amazing. Same width as my MSR Hubba Hubba. It's going to be the same design as the 1p tent just larger I'm guessing. I can't wait to not have to set up the tent and then the rainfly..
Yeah once you’ve used a tent that pitches fly first it seems rediculous to use anything else. Same thing is true with tents that sag in the rain. So much nicer to have a tent without these two flaws. G'day Dan and that 2 person will have the winter inner option is that right? So Autumn (fall) in Canada is spring here in Australia, (about September?) a much quicker post date from outlay which I like! Did you decide on the mesh top panel/section extension downwards of about 5 cms from the original mentioned on BW.com? The solid material is great - barely heavier than the mesh (less than 20 grams difference). I will bring the mesh about 5cm lower than you see here. I should say that timeline is a very rough guess. I presume the factory will be a bit quicker to get things going since there is a lot of overlap with the 1P and we're already producing fabric etc, but it's hard to say. We launched the 1P on July 9, 2018 and it's on track for delivery in mid-April 2019 (9 months). I hope the 2P can be more like 6-7 months but that's mostly just me hoping. Massdrop handles all the production management so I don't really know. I think delivery by the end of 2019 is a safe bet but hopefully a few months sooner. Ta Dan. Barely heavier than the mesh and the slightly bigger window-both winning outcomes in my view! Ta for the pic as well. Is that a window flap up in the top left? Sorry for the multiple questions here and on BPL. I am all over the shop. That's a pocket in the top left (to the left of the mesh window). It's not very good though. Trying to decide if I should delete it or design a better one. The 1P has a pocket all along the ridgeline, but the 2P ridgeline is getting awfully long for that. Got to admit I quite like ( rectangular) pockets that sit just above (the top edge of the) floor height. About 8-10cms in height and as long as you might want. But space and perhaps weight problems in this? I could do that. I was hoping to have a pocket that also doubled as a place to hold my headlamp while reading, since I find it a lot nicer to read without my headlight strapped to my head. So was hoping a pocket would work where it is now, but it's too small to properly swallow a phone and I expect many folks would want that. Right yes, I see that, makes good sense. Or two wee pockets? One wee one and one a tad bigger? One high, one low? I just like the low one as you can get to whatever from your bag/quilt, without removing too much of your arm if it's nippy. Though it's not a big deal. I've been really interested in this drop for my NEw Zealand trip at the end of next year. However, Massdrop has a history of letting shipping dates slip for months at a time and also unexpectedly cancelling orders. Is there any guarantee this is going to ship on time? Hi SCJ, The short answer is that there is no guarantee for the shipping date but the tent is ahead of schedule and much more likely to be early than late, particularly if you are in the first 1000 tents. Massdrop was able to get enough materials to expand the production run a bit beyond 1000 tents but the additional few hundred tents are a bit behind the first ~1000. So the first 1000 are on track to ship out in mid-April, while the last few hundred are on track to ship out at the claimed date of late May. So if you do order in the next week or so, then you'd be in the first 1000 and it would likely arrive in April. Things have been moving along well. We've got the custom fabric made, signed off on the final production version of the design and production is now underway by a very experienced tent manufacturer who is used to working with deadlines for many other brands, so any substantial delays are unlikely at this point. Thank you for your reply! I will look into a 4 season tent too. I will just have a collection of tents. If you just want to go camping in the winter with maybe a moderate snowfall, the X-Mid would do well. But if want to do serious winter mountaineering where you’re pitching in exposed sites in extreme environments then yeah you’d want a 4 season tent. Dan that looks very well thought out. I almost passed this over. But glad I watched the video. I might buy a one man this year and will be considering this for my late fall superior coastal trail trip. Thanks Spanky. I haven't been on the Superior Coast Trail but I did hike the Pukaskwa Coastal Trail a bit further north a few years ago. A friend and I packrafted the Pukaskwa River to Lake Superior and then bushwacked a couple days up the coast of the lake until we got to the southern terminus of that trail to hike out: https://backpackinglight.com/forums/topic/78225/ Massdrop will have another 300 to sell before too long, and then that'll be it for a while (probably until spring 2020) so if you're interested then clicking the "request" button on the drop page is the best way to stay in the loop. You'll get a email when it re-opens. I already clicked the request prior to the message. Thanks for the link Pukaskwa is what we were looking at doing. Getting dropped at north end by boat or by friend of mine via Float plane. Then hiking out. Vote for just a loop on the ceiling somewhere to hang a small lantern. Right now you can put a headlamp in the mesh pocket that goes along the ridgeline and you might be able to rig up a way to hang a lantern too. Hard to say. What type of a lantern are you using? It is relatively light and electric? I heard back from Massdrop on the next drop. It's going to be at the beginning of February (2 weeks). I'm not sure if it is literally at the beginning (Feb 1) or just close to it, but sometime around then. I'm not sure if they have exactly 300 more to sell or a bit more, but it's looking like it'll sell out in ~2 weeks and then that'll probably be it for tents for a long time. For the lantern, it'll work well as long as it's not too heavy so it pulls the mesh down a lot. The pocket is sewn down the middle to divide it into two halves (see video), so you might be able to rig it up here to have a good setup. Or just put it in the pocket. I was curious if you have a picture of the fly looking at it from the other side? Looking at the width? And thank you for the update on when they are dropping again. I've been checking everyday! Talk about a beautiful landscape. I hope I can explore a place like that one day. That's amazing! There's more photos here including some that show a person inside the tent. I think these give a good look at the headroom: http://durstongear.com/product/x-mid-1p The twin peaks of the tent are pretty high (43") and spaced well apart so you get almost that much height across most of the inner. So the headroom is on par with the most spacious 1P ultralight tents. For example, the TarpTent Notch also has twin 43" peaks, but they are much closer together (~30" apart instead of 50" apart) so the X-Mid has that much height but over a lot more of the inner. You could use DCF for an alpine version, with a 0.8(ish) oz/sqyd material it would probably be lighter than the standard model, but way more expensive. However, for the intended use (high winds and people who really want quality stuff for added safety) I think that it would sell despite a high price point. I like DCF - I've been building tents and tarps with it for a decade - but in my opinion it is being mis-marketed by quite a few companies. Certainly the dyneema fibers are incredibly strong, but the material has several other weaknesses so overall it is not more durable than the common woven fabrics, despite commonly being mis-marketed as being bombproof. For example, Nemo sells a $150 DCF groundsheet for their tents which they refer to as "bombproof" and "stands up to gravel and sharp surfaces" which couldn't be further from the truth. An abrasion intensive application like this is the worst possible use for DCF because its abrasion resistance is really low (the dyneema is inside the sandwich so it doesn't even factor in to abrasion resistance until you've already worn through the fragile outer mylar layer). Thankfully some companies are more upfront about the limitations of DCF. For example, Mountain Laurel Designs who that offer their shelters in both DCF and woven materials do say that their silnylon versions last about twice as long, and they would recommend the silnylon for winter use. Certainly the dyneema is very strong so the tear strength is excellent, but it has several other short comings that limit it's overall durability. First, DCF has virtually no stretch so forces don't get spread out evenly. That's why this DCF hammock failed with a 300 lbs static load, even though it should have been capable of holding about 4000 lbs (36" wide x 105 lbs/inch). This is a common problem with DCF shelters: the strain is not even loaded so you see stitch failure and reinforcement failure when stress gets loaded onto a small area. Some will say this is just poor design, but even for a perfectly constructed shelter it's not possible to even distribute stress because many factors affect the pitch (e.g. uneven ground). Secondly, the bonding techniques used for DCF weaken dramatically in cold weather. No one talks about this, but once you get down to 10F or so, the bonding tape loses most of its strength. If you see the specs and/or try it, you quickly realize it's sketchy to rely on DCF in a winter storm. Here is more info on that. You could sew it instead, or bond and sew, but DCF has very poor ability to hold stitches because it's not a woven material, which is why DCF is rarely sewn. The current technology just isn't well suited to use below about 20F. Thirdly, snow sticks to DCF much moreso than a silicone coated fabric, so its snow shedding is far worse. DCF is already a bulky material (about 50% larger packed size) and then when you combine this with how easily snow sticks, it ends up massive when you pack it up after a snowfall unless you spend a fair bit of time cleaning it off. Even with a nice cleaning job, the weight savings of DCF will often be more than negated. So overall, I don't think it's a wise material choice for demanding winter use. There's no real advantage to it other than some weight savings, which aren't that substantial in the context of 4-season/winter camping where loads are much heavier. A woven material is a lot more trustworthy in an alpine storm. I don't have any immediate plans for an alpine version but I would like to offer one eventually. That would likely use 30-40D woven fabrics, twin guyouts at the peaks (one to pull out each side), mid panel guyouts etc. But that would probably weigh 35oz instead of 28oz so I suspect the market for this would be smaller because the regular X-Mid is already quite weather capable. 6 inches of snow is no problem. Overall, my opinion on DCF is that pretty much everything about it is bad except that it's amazingly light - that's the only good reason to use it because it's expensive, bulky, hard to construct, see-thru, poor abrasion resistance, poor torsional resistance and even for tear strength it's only average because its high ratings are countered by its lack of stretch that results in being exposed to higher forces. So I think it really only makes sense to use in a tent that places a huge emphasis on being superlight. But since it is so wonderfully light, we are in the early stages of a DCF version of the X-Mid (a long ways off). This will be pretty much the opposite of an alpine version because I want to be honest about how it's marketed. Rather it's more of a 2 season version that is stripped down as much as possible to be an extremely light: single wall, smaller zips, 0.5oz DCF, minimal features etc. That'll cost a lot more and won't be nearly as well rounded, but it'll weigh a lot less. Lastly, I'll just mention how wonderful the poly is in the regular X-Mid. It has enough stretch that it doesn't stuffer the uneven stress loading problem of DCF, but it also doesn't sag or lose strength when wet like nylon, so it stays looking and performing good throughout a storm. It's really well rounded stuff. Noticed you mentioned it in a couple posts earlier this week. Thanks for following up with me! I'm eagerly waiting for the drop to open in the coming week(s)! Yeah you can get even stronger versions of DCF but the weight savings disappear quickly. Most UL tents are using 0.5oz DCF (aka CT1E.08) but some companies are using 0.75oz DCF (aka CT2E.08). Which version is better was a hot debate in the UL community for a bunch of years, but now you can get really light nylons that weigh about 0.8oz, so the 0.75oz DCF doesn't really make sense anymore because it's way more expensive but not lighter. It might last longer but it's hard to say because both are still fragile materials with their own pros and cons. As I have said, a superlight DCF version of the X-Mid is in the works but it's in the very early stages (I don't have any prototypes). It will likely come out sometime in 2020. The regular version is undoubtably more well rounded, high performance and versatile, so it's the better choice for everyone except the super ultralight geeks. Also the regular X-Mid is easily going to sell out this year and most likely the price will be higher next year since the mark up is very slim on these, so if you did want to switch to the DCF one in 2020 you could likely sell the poly one for about what you paid for it. Massdrop is going to re-open this for orders this coming week. I'm not sure what day but they said early-mid week. They only have 300 more coming in time for this upcoming hiking season, so I expect this drop will be limited to 300 sales with a delivery sometime in June. That'll likely sell out in about 3 weeks, so no panic but this probably is the last chance to get one for the upcoming season. Would you ever consider a poly floor with a DCF. What would that cost you in weight 1 oz? is there other issues like joining the Cuban to the silpoly? It's no problem to use silpoly for a floor in a DCF tent. This finished weight of sil/PU poly is about 1.25oz/yd and there is about 2.5 square yards in the 1P floor, so that would add about 0.6oz over using 1oz DCF that is commonly used. I think that would be a prudent choice because you get a more durable floor plus a lower price by $50 or so, for only a 0.6oz penalty. However, the durability of DCF floors is almost entirely the result of the outer mylar, not the inner dyneema, because abrasion resistance is the limiting factor for floors and the DCF doesn't help with this because it's on the inside of the sandwich. So you really want the tougher .18 mylar option, not the .08 mylar that is used for tent flies - but it doesn't really matter how much dyneema is inside that. Most everyone is using 1.0oz DCF with the .18 mylar for floors but there is another variant of DCF that also has the thicker .18 mylar but with less dyneema so it weighs 0.7oz rather than 1.0oz (not to be confused with the more common variant of DCF that also weighs 0.7-0.8, which has the weaker .08 mylar but more dyneema). I think this version would probably last just as well as the 1.0oz stuff as a floor. It would still be less durable than silpoly and more expensive but at least you'd about 1.3oz rather than 0.6oz, so I think there is a case for using that is a super light tent. Will have to check this out now. Strange feelings coming up in me. Before drop ended shipping date was „ very likely early April“. ... and very good chance that it will be delivered mid- April. Also, updates have been delivered almost on a daily basis. Since then the update have become enigmatic and only when being forced by buyers. Since then you aren‘t talking about early April or mid-April delivery anymore. Instead, you are selling the mid-May date as a „win“. Very sad to recognize I was trapped by those promises. As I describe in my post here, I believe this is a miscommunication. An April delivery for tents ordered in September and December such as yours still looks like a reasonably likely outcome (when the estimated ship date was May 24). As I have said all along, I can't promise that but there is a good chance. To clarify what I wrote then, I never said delivery was likely in early April. Rather in response to you, I said "there's a good chance it is early (April)". So my intent here was to say that delivery has a good chance of being early, and then in brackets I suggest that refers to April (rather than May). In those same comments I wrote "folks should have them sometime around mid-April (still no promises, but very likely)". My intentions were to say that mid-April looks likely and that continues to be true today. The "good news" of this May date is only in reference to the final 300 tents that have not been sold yet. I told many people that we had some final tents coming in a separate shipment around June which would be available to order at some point. The factory is now ahead of that schedule for that shipment, which is good news for people wishing to order those. Dan, you are a man of great patience. Absolutely. What's status on the 2 man version? It's coming along well. We've been through two generations of prototyping with the third generation showing up in the next week or two. The 2nd gen prototype is actually quite good. Mostly there are just little details to fix like better pockets, making the vent a big bigger etc. I hope we've got these things dialed in for the 3rd generation prototype. The biggest outstanding question that I am wavering on is the size (width) of the tent. The first prototype had a 46" wide floor but many folks wanted it wider so the 2nd generation prototype is 50". It's quite a generous width now, but I am somewhat hesitant about the footprint of it (it requires a large-ish spot to pitch). Since the sleeping area is on a diagonal, the tent isn't that long but it is does get wide when the design is modified to be a 2P. So there is an trade-off there where the 2P can either be more spacious, or fit better in smaller tent sites. At this point I'm leaning towards a "happy middle" where the tent shrinks a bit to about 47" wide. Since there is plenty of length and headroom, that'll still be a comfortable amount of space while saving a precious few inches in footprint size that can be the difference between fitting and not fitting into a site. Looking forward, I expect the 3rd generation prototype will be quite refined but likely need a few details tweaked. So we'll presumably do a 4th generation with those tweaks plus the aforementioned changes to the size. Hopefully that 4th generation prototype arrives basically perfect about 2 months from now and we can proceed to launch it soon thereafter. It’s a linear increase in external footprint width to gain internal width correct? So the 3” difference between 47 and 50 would o my be a 3” difference in required foot print width. So regardless of the Inner width this will still be a larger footprint 2 person tent. So I don’t see sacrificing width for a marginal improvement in a category as worth it. If footprint is part of your decision factor whether its 47 inner vs 50 inner isn’t likely going to change where it ranks in the foot print consideration. The advantages of this tent over its competitors - ease of set up, No Stretch, internal volume and price are what is selling this tent so wider fits those variables well. On the otherhad by going narrower you may lose people who want to fit two large pads. I definitely think 50" would be great. My current tent(MSR Hubba Hubba) is 50" and I have a hard time seeing 2 people in it as it is and it has nearly vertical side walls. Whatever you decide I'm sure it will be awesome and I'll still buy it in a heartbeat. How big is the current footprint with 50" floor width? 85"? 90"? 95"? Given that the 1P is 67" I'm assuming the 2P is close to 90. I realize we're dealing with a hypotenuse + some TBD offset in each person's sleeping position so the math isn't super obvious. As others have noted, I don't think that an 87" wide site is significantly easier to find than a 90" wide site. Given that your design objective is broad utility, I think sufficient width for two 25" pads fits with that goal. I think this issue highlights one of the drawbacks of the "diagonal floor" design approach. Tradeoffs! So it's not actually that big. Shorter than most tents but a bit wide. The floor area of the fly is very similar to something like a TT StratoSpire 2 but of course the shape is different. With the wider ends, it visually appears wide upon first glance, but actually both the maximum length and width are less than many tents (e.g. The SS2 is 112" at the widest point versus 88"). Which shape works better depends on where you're pitching it. 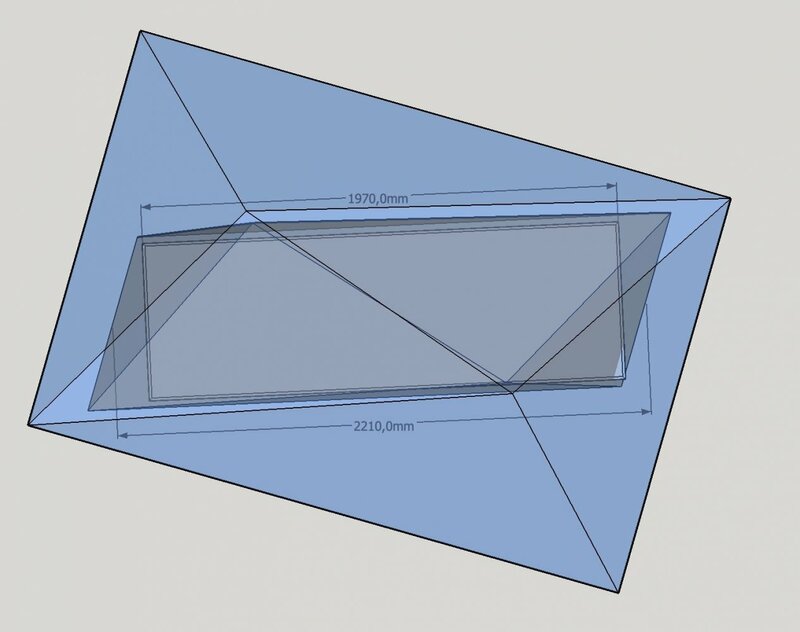 Most developed tent pads/sites are rectangular, so the X-Mid would likely work unusually well for its size, whereas if you're trying to pitch it in a small circular clearing in the forest then a hexagon shape would have a better chance of fitting. It’s a linear increase in external footprint width to gain internal width correct? Pretty much. Chopping 3" off the floor would save about 2.8" in width. Analysis paralysis. Every engineer's best friend. Your footprint comparison seem to indicate that even with the 50" widht, the footprint is pretty much identical to most of the popular tents, wider but shorter measurements on the fly. I would really like (and buy) a little wider option, the tents with a 46-47 inch footprint doesn't fit two long and wide pads unless sleeping head to toe, so they are a bit cramped. Ideal for one small and one big person or one person with a dog or two, but cramped as a true two man option. I guess the drawback with the 2p X-mid is that the diagonal inner will offset the sleepers a bit, so the toes of one person (of equal hight) will be about where the other will have their knees. Maybe not that much offset, but certainly a bit, so it isn't going to be the best option for a couple who really like to snuggle in really close to each other, but a narrower inner will make that problem even worse, I guess? I know what you mean about the sleepers being staggered a bit (#1 below), but the 2P will be a bit longer so that two sleepers can be side by side (#2 below). This works well because the unoccupied area at the opposite corners has the lowest roof anyways since it is furthest from the poles, so it is best suited for stashing some gear. It's quite a comfortable tent to live in like this because you have a good sized sleeping area, plus some area at the head/feet for stashing gear, plus nicely sized vestibules. Awesome, it is really roomy lenghtwise. Thank you for your answer. Just my opinion, but don't make it too narrow. The extra few inches cant make much of a weight difference, I would guess 0.5-1 ounce, but it will truly make this something as unusual as a roomy two man lightweight tent. That will make it a true one in a million tent, the market is already flooded with small, cramped space lightweight tents, there is 12 on the dozen of those. And to be frankly honest, most of them are as light or lighter than this will be, I would guess the 2p version will end up somewhere in the 30-35 oz range? Your advantage is the design and the material, if you add size to that, you will have a truly great product! Thanks for the feedback. I am back to leaning towards 50". For its size it should be very light since the geometry is very efficient (e.g. minimal seams, stakes, guylines and a good volume:area ratio). I think it'll be about 36oz yet it is a similar size to something like the TarpTent StratoSpire2 that is 44oz. I'm pretty sure that any tent that is lighter will be because it's substantially smaller, or a singlewall, or using lighter materials (notably DCF). In contrast to others i'd advocate the narrower version. I do not know anybody using a 25'' mat and for 20'' the smaller version will be plenty wide. I might be wrong but i think words like 'luxorious' were not high on your priority list when you designed this tent. It is not just the weight. With a larger fabric span the tent will be less stable in high winds, snow etc. We all know there is no all-in-one tent for every purpose. I guess at one point one has to decide which niche in the market one wants to occupy. Do you want the tent to be leaning towards the UL-spectrum or rather towards the luxory-wide-mat-spectrum? Dan, Your design of the X-Mid 1P and 2P is just outstanding and refined,..... good design is "timeless"!! Your eye for detail, concern for the user experience and mind numbing attentiveness to hundreds of blog inquiries is without peer!! Your tents eliminate the complexity of pitching and provide an oasis for personal renewal and refreshment with spaciousness and functionality after a long day of hiking. Re: the 2P: May I urge you to consider making the interior width of the 2P 50", as I believe larger framed hikers with 44" + chests will need the extra width for their shoulders/arms to create personal space with tent mates and avoid contact with the interior screen walls. The few extra inches of campsite room are easy to find, by rotating the tent if needed. Once acclimated to the 2P, a user will be able to check for fit prior to pounding one stake since it's a rectangle. I meet more and more burly hikers as a thru hiker who need a 25" pad, I'm super excited about getting a 1P for myself, but am a Boy Scout adult leader in the U.S. I believe your tent will find strong appeal among scout troops, Scout camps, Philmont Scout ranch, canoe trippers as well as weekend family campers due to it's constellation of benefits: simplicity, ease of set up in the rain, cost, liberal vestibule and interior spaciousness, intuitive set up, durability, engineered tolerance and stability in wind and weather and particularly for impatient scouts- ease of ingress and egress with durable #5 zippers with no guy lines, weather permitting. Would love to discuss additional distribution models to meet other markets with you after the 2P drop is over, Thank you again!!! @dafra Thanks for the feedback. Indeed "luxurious" isn't the target. I would say the aim is to create a "well rounded" ultralight tent, so it is as light as it can be without making major compromises in functionality (e.g. single wall, no vents, tiny) or durability (e.g. #3 zippers). As it pertains to size, I'd like it to be a reasonable size since riding out a rain storm in a tiny tent isn't fun, but I don't need it to be luxurious either - just reasonable. It seems like a lot of people consider 50" to be that, because we see most lightweight tents are typically 50" such as those from brands like TarpTent and even very light tents from bigger manufacturers are 50" (e.g. MSR Carbon Reflex 2). I think a little bit less would still be reasonable (47-48") but once you get down to 45" or less then it seems like many folks find that awfully small for two. So I wouldn't really say 50" is luxurious - that's only a few inches of additional width on each side of two 20" pads. Rather it's more typical for a lightweight/ultralight tent and then 55-60" for a 2P tent is luxurious. At this point, I'm leaning towards making the 2P about 50" and then perhaps in another year coming out with a DCF version of the 2P that is focused on being as light as possible so it will be smaller, single wall, less beefy etc. @Danluvstohike Thanks for your enthusiasm and kind words. Indeed hopefully people will find this tent to be an "oasis for personal renewal" and that is well received by a diversity of people such as the scouting folks. I think a lot of the benefits like the simple, intuitive pitch will be appeal to folks in every niche. Hi Dan, We do have some discussions with respect to how long a person really can sleep comfortable in the tent, IE not touching the inner tent with the sleeping bag. Given that you have good sleeping map, we estimate you need a 40 cm vertical high on both ends from the inner tent to the floor. Based on this requirement some calculates that a person can not be taller than 175 cm. Is this correct ? This is a difficult thing to answer partly because the shape of the tent is complex, and partly because it requires a number of assumptions about the sleeper (e.g how thick the sleeping bag is, are the corners of the bag rounded etc). Anecdotally, I'm 180cm and I sleep in this all the time on a 2.5" pad with a 3 season sleeping quilt and don't touch the ends. But if I hauled out my -25 C winter sleeping bag that is way larger with a big hood then I might brush the ends, but I would still fit fine in the sense that I could still fully stretch out wouldn't be pushing the mesh into the potentially wet walls. My subjective opinion is that someone up to 185cm fits nicely into the tent, and it works okay to 190cm (particularly if they use a quilt and not a bag) and then beyond that is too tall unless they are a side sleeper than doesn't sleep fully stretched out. More quantitatively, this tent is 220cm long and the end walls are quite steep, so it preserves a large portion of that length at 40cm off the ground (about 180cm). If you compare that to other trekking pole tents, most are a similar length or a bit shorter at the ground, as 210-225cm is typical, and then certainly most are shorter 40cm off the ground due to more inward slope on the end walls. So it's not a tent for very tall people but I think it is above average in length and works for hikers up to 185-190cm. For comparison, TarpTent is saying their Aeon tent can accommodate hikers up to 213cm (7 feet) with a floor that is 223cm long. So they are claiming a max height that is 10cm less than the length of the floor (213 vs 223cm) while I am claiming a max height that is 30cm less than the length of the floor (190cm vs 220cm). Of course the slopes of the end walls differ but they appear to be the same ballpark. I think their claim is quite optimistic - and reviews have said as much by suggesting a 15cm shorter max height of 198cm. I think that shows that my 190cm max claim is pretty fair considering my tent is only 3cm shorter. Hi Dan, Someone has a dream to sleep extremely comfortable in the tent. Hence we are talking about Exped 7/9 LW mat…. However, based on this drawing, I would say it is a close race when it comes to hitting the inner tent with the mat. Is it your impression that the mat will be so close to the inner tent ? Wow you are really putting in an impressive effort with a 3D model! Is the question whether a 197 x 65 x 9 cm pad will fit? Your 3D model looks right. Indeed it is a "close race". A pad of that size will fill pretty much all of the floor width and extend to near two of the corners. Three things to note at these corners are: 1) Most pads, including the Expeds, are a bit rounded at the corners. 2) The end walls of the X-Mid are the steepest at the two corners where the pad comes the closest, so the inward slope here is very little. 3) With the little bit of extra floor width (71cm vs 65cm), you can rotate the pad slightly to move it a little bit out of those corners. So I think that pad would fit with a few cms to spare but there is a possibility that it will brush the walls lightly at those corners. I'm confident that the pad won't push substantially on the walls, but it won't have much extra room either. So it depends on how much space you want. Super excited that I got one of the tents. So excited, that I'm already interested in the 2 person. Do you have anymore info/specs on it? More pictures than are on your website? Thanks for the support on the 1P and interest in the 2P. We're hard at work on the 2P but we don't have any further info/specs/pictures to release at this time. I don't want to give away everything before it's out. If you stayed tuned on here you should hear something before too long. I just wanted to say that I really like the Durston logo design. Kudos to the artist on that. Could you explain how to pitch the inner? I just got my tent and set it up and the fly pitches beautifully but the inner isn’t working. Do any of the corners of the inner connect to the fly? It seems to me that I need to stake all four corners of the inner separately, or at the least, two. And one of the poles presses against the mesh. I’ll try again tomorrow but some tips would be helpful. Hi, There are four cords that connect the four corners of the inner to the four corners of the fly, so you don't need any additional stakes. These four cords are shown below as the red lines. They have a clip on the end, and there are black D rings inside the fly at the corners, so you can clips the cords to the D-Rings. I had got confused initially, too. I see someone else responded, but here's what I did and it was easy. Just pitch the fly, first. Stake out all four corners in a rectangle. Then insert your poles (right through the vents is easiest. Make them nice and taught. THEN up on of the doors and bring the inner mesh inside and lay it flat. It attaches to the fly via buckles right at the tent pole grommet areas. Two attachment points. Also, each corner of the inner has a stretch cord with hook. Stretch each corner of the inner and attach to the plastic D-rings on the inside corners of the fly. Viola! No stakes involved for the inner. Now that it's all attached, you can leave it attached and just un-stake and take it all down. Next time you put it up, the inner is all set and already attached. The tent is great dan! I absolutely love the color, set up was easy (following the directions on the stuff sac), and the amount of storage space under the fly is awesome! I am very pleased with my purchase and will shoot you a review this fall. Thank you for all your hard work!